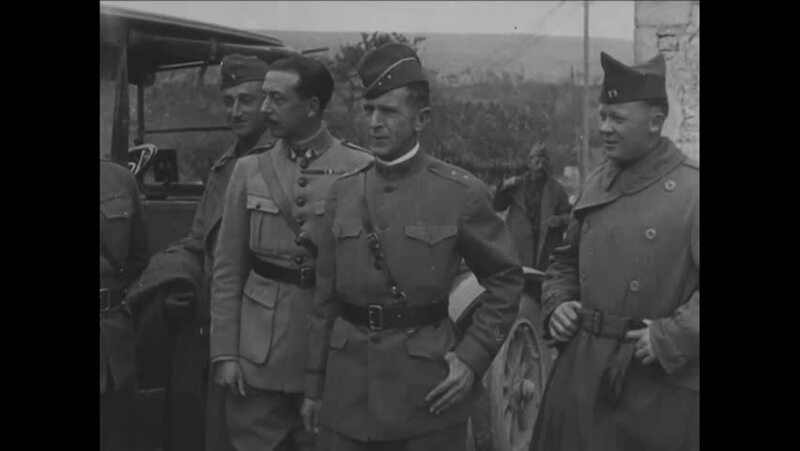 CIRCA 1918 - General Bullard poses for the camera in France. hd01:38CIRCA - 1918 - An airship lifts off, and soldiers use an inflated balloon and survey equipment, in coast artillery training during WWI. hd00:38CIRCA 1919 - Corporal Lew Brice of the 51st Pioneer Infantry entertains his fellow soldiers with a comedic dance routine. sd02:301920s - Henry Ford camping party, 1920.
hd01:11Army officers make their way down an alleyway and pose near a vehicle in France in World War 2.
hd01:24An American Expeditionary Forces motorcycle courier is shown on an airfield and a pilot carries a package in a biplane during World War 1.
hd01:10CIRCA 1910s - Cannons and artillery are tested and made ready for battle in World War One.